Guedry Cemetery Inc., is a perpetual care cemetery. This means that the amount you donate goes towards the grave and cemetery care taking. Obviously over time there is a need for more donations than space allotment. Guedry Cemetery Inc., is the most unique cemetery in the area for 2 reasons. One being that it is one of the very few (if any) that has EVERY SINGLE grave accounted for. Even nameless man has a marked spot. It is also one of the first in the area to have it's searchable database of every grave online. 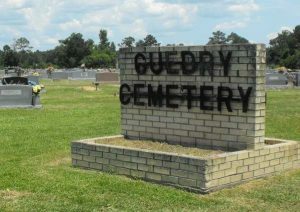 Guedry Cemetery Inc. is run by board members who are elected by the community. They make decisions on several things and meet regularly to make sure everything runs smoothly. With board members decisions, the website and other forefronts of the cemetery are always on the cutting edge. This latest website has much more to offer than ever before. Guedry Cemetery Inc. has been around from way back. The cemetery dates back to around 1900 and is among one of the oldest cemeteries in the Hardin County area. Guedry Cemetery is also a perpetual care cemetery. There is not a single grave that is not accounted for. If that is not all, Guedry Cemetery is about to be the most unique cemetery in Hardin County! The website was first up on December 31st 2001 and efforts are made to constantly improve the site to better serve the community. Please read the ‘What’s New‘ section for detailed information. This version has linked searchable database of every one buried here. Possible future update will also allow you to search and pin-point location of their graves right from your home/smart phone if it has in built active GPS. All you will need to do next is drive to the site and walk up to the grave. The site works 24/7 so no way to get lost. If all goes well, soon there will be a computer at the cemetery where you can do the search the database of all those buried in Guedry Cemetery and pin-point their grave’s location too.